Nearly 50 years ago this March, Jim Robinson made Minnesota boys’ basketball history. “I worked the [state] tournament three years in a row,” beginning in 1971 as a game official, Robinson proudly stated. The longtime referee, now a supervisor of officials for the Minnesota State High School League, reflected on his legendary career in a recent MSR phone interview. Then sometime in February of 1971, he received a simply-worded letter inviting him to attend an officials’ meeting at the University of Minnesota. “It said, ‘Welcome, you have been selected to [work] the state tournament,” Robinson recalled of the history-making correspondence from the High School League. He would be a member of the eight officials who would work the annual tournament to decide the season’s state boy’s high school basketball champions. First, he was assigned to work the game that featured then-Minneapolis Central, “who at the time was one of the few schools in the metro area that was primarily an all-Black team,” said Robinson. And since he also was Black, as expected, some in the crowd hinted quietly or loudly that Robinson would be one-sided in his officiating. “Just about every call I made, whether it was [for] Central or against Central, I got heat from both coaches,” Robinson remembered. Then, late in the contest, “I called the foul, but I didn’t know who the foul was on, the number of the player and more importantly…I didn’t know if the ball [went] into the basket or didn’t go in,” Robinson said. There wasn’t instant replay then but the scorers’ table helped him out, and the foul stood as called. And his place in history was recorded as well. Working the state tournament “was a great challenge,” and it wasn’t about not being the same skin color of most officials that regularly got such plum assignments, Robinson pointed out. That first year, he was one of only two non-school officials chosen — up to that point the referees were also school teachers or administrators — Robinson for many years was the director of the teen center at the Inner City Youth League in St. Paul. Also, he later learned that his name came up after being “scouted” by a High School League official to determine whether or not “I was worthy of being a state tournament official,” Robinson said. “I had some mixed feelings against this guy who was selecting officials for the state tournament for years” and the official once “made some disparaging remarks” about him. “I jumped up and got in his face. My friend separated me from him,” Robinson recalled. 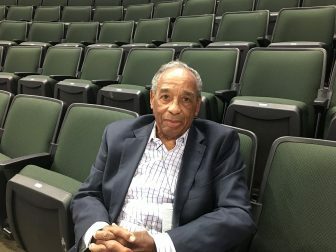 A high school athletic director also told Robinson that his name was being discussed in an athletic directors meeting after a St. Louis Park state legislator and the late James Griffin, one of the state’s first Black officials and Robinson’s mentor, “lobbied the legislators [who] wanted to know how come these many years that [the high school league] never had an official of color refereeing in the state tournament,” Robinson said. Finally, he looks back with pride — Blacks today working state tournament games are commonplace. But he easily remembers the time when it wasn’t this way. A great man Jim Robinson is and I personally want to thank him for his commitment to ensuring the development of the great officials who come from the state of Minnesota. Yes Jim Robinson is one of the good guys, it’s crazy I went to Jimmy lee teen center and also my kids and Jim Robinson wad still taking the time to be involved just thought that was great. Everyone knows how challenging it can be with teen ages but Jim Robinson ran a wonderful organization. Charles Hallman, thanks a lot for the post.Really thank you! Much obliged. Very good article brother Hallman, although I am a VERY biased reader. One small correction, if I may. during the time Mr. Robinson was the director of the “Loft Teen Center” in St. Paul, before it moved to the site of the old Oxford park, when it became the Loft Jimmy Lee teen center. I appreciate the love for someone special to me, but hopefully others feel is special to Saint Paul and the TC’s more broadly. Saw Jim just a couple months ago while I was officiating a game in St. Paul. I knew he was watching so made sure I was on my game. He is still out there helping officials out! Really cool article and it has to mean so much for this man. I officiate in Kansas and just think these stories are so honerable it “Wells” me up inside. Black, white, Hispanic, whatever……….good dedicated officials are so difficult to come by these days. I hope this article encourages a few new good men/women to join this avocation that they will love for as long as Mr. Robinson did!